We’re on the pursuit of happiness. Since the beginning of time, all that mankind really longs for is to chase their dreams and find happiness along the way. At Cyberclick, we’ve seen that these aspirations are not only possible in personal lives, instead they are just as possible and necessary in corporate lives as well. Sound naïve? Well, from a financial viewpoint, investing in your team’s happiness has proven to increase ROI. We’ve found that people matter. People and their happiness are a priority. If you take care of your people, you’re taking care of your success. In our pursuit of happiness, we focus on building the corporate culture, selecting values that symbolize the corporate spirit as well as team building. Cyberclick believes it’s important to recognize each team as a unique combination of personality types. Effective selection of profiles hired into a company is essential when building a team and achieving happiness. We also believe a team is more than the sum of its parts. When it comes to marketing, a team of a highly diverse network can help you develop more complete and creative outcomes. When trading information or skills with people whose experiences differ from your own, you provide one another with unique, exceptionally valuable resources. So what makes a marketing team? A marketing team takes charge of promoting the solution to its customer’s pains. The team collaborates to promote a solution so creatively that it becomes the best, there is no longer a decision to be made between competitors. Who makes up a marketing dream team? It takes someone with both high creative and analytical skills to be a true visionary. In a marketing context, they could be the driver and director of the content strategy. The visionary is resourceful, and has the ability to recognize skills of each individual and how they can play a role in creating the end vision. As a leader, they are closely aligned to the strategic goals and values of the organization. Through commitment, energy, and determination your visionary will create the sequence of steps to content success. When confronted with obstacles, their entrepreneurial drive kicks in enabling creative problem solving. You can spot them from miles away. When collaborating with the team on the content strategy your visionary will commonly make comments to keep the team focused. "Let's come back to this later if we have time." "We need to move on to the next step." The visionary sees the goal; the enabler gets us there. This individual will show clear abilities to execute and will be rich in original ideas. Their strengths lie in identifying content elements and engagement topics. "Why don't we consider doing it this way?" What are individual stories without a storyline? Everyone craves a good plot. To tell a tale, this member links a series of stories to fit into the overall content plan. They’re strength lies in making connections and clarifying content objective. "So here's what we've decided so far"
The importance of balance in this role cannot be overstated. The ability to see the grand scheme of things while also paying attention to detail are important skills of the editor. They understand the grand persona of the brand, expressing it through details in punctuation and polishing. Additionally, editors are great at maintaining consistency within the team and in the communications of the firm. Editors ensure the desired voice of the brand is effectively communicated. "Are we all in agreement on this?" Everybody loves the smiling ray of sunshine that motivates the team in low times. No matter how grim things are looking externally, the internal environment will always stay warm when you’ve got an encourager on the team. Encouragers have strong interpersonal skills and always create energy through humor and enthusiasm. Their extroverted nature also puts the encourage in the perfect position for idea clarification and confronting problems face on. The encourager is a great optimist, but every successful team also needs a realist, a logical thinker driven by data. The analyst possesses analytical strength offering the team objective, measured, and dispassionate critical analysis. They contribute at times of crucial decision making because they are capable of evaluating competing proposals using a more scientific methodology. 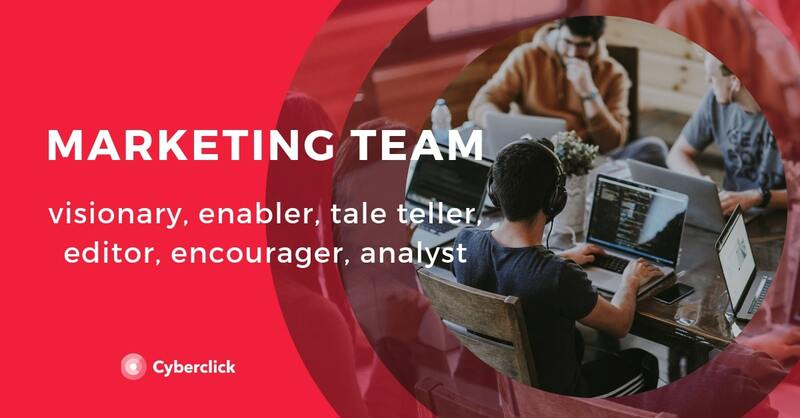 In your marketing team this team member will work closely with the visionary, sharing with them a critical evaluation of content strategy results. "What other possibilities are there?" "Let's try and find a better way." Why this dream team will lead to success? A team composed of diverse personas including a visionary, an enabler, a tale teller, an editor, an encourager and an analyst, is bound for success. This wide range of individuals contributing in different ways, with clear common goals, balance, and commitment will nurture an environment of productivity, creativity, and above all happiness. For a deeper insight on the organizational culture that we have developed over the years at Cyberclick and the keys which have allowed us to win the award for Best Workplaces in Spain time and time again, check out David Tomás novel “The happiest company in the world”.